Often, archives and museums do not get papers from military veterans to help explain or document their service. It is especially frustrating when you cannot find connections between service individuals from the same community in North Carolina, when you suspect they know each other or were friends. Often, this occurs when you have a photograph of military personnel posing together whom you suspect are from the same community, school, or work place. Fortunately, every now and again you get enough information to be able to make connections in a single photograph among those pictured. Such is the case with the following photograph that has come down the generations through the Dickie family of Henderson, N.C.
All three men pictured are connected. In the case of Jamie and Durward Dickie, they were brothers. But, both brothers knew William Daniel through family and community connections in Vance County, which included the facts that their families were farmers and involved in tobacco growing or buying. The three men also knew each other through Durward Dickie and William Daniel serving in the same two military units in World War I. 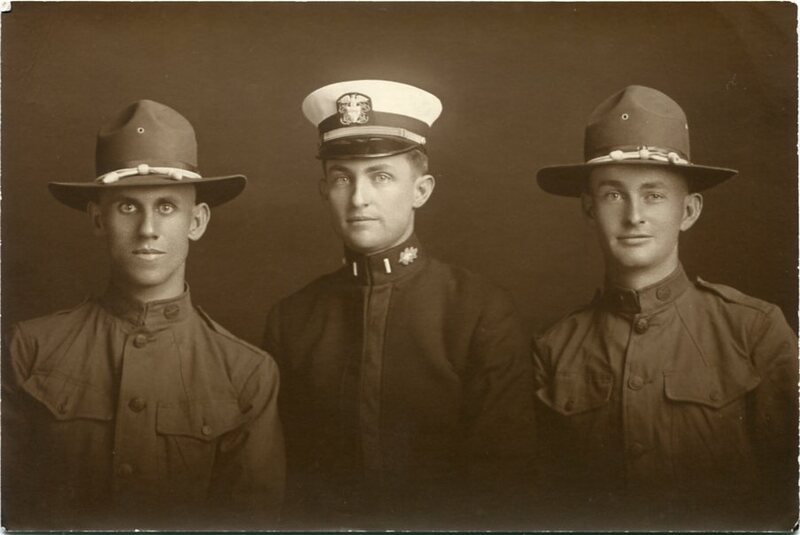 All of these personal connections led the three men at some point to come together in the United States (either before two of the men were sent out to Europe or after they returned to the U.S. from Europe) to have a group studio portrait taken that has now become a precious record of the one family's WWI service history. What follows are the varied and somewhat sad tales of the men pictured here, as their lives developed in WWI and diverged after the war. The biographies are meant to be short introductions to their lives. William Brodie Daniel (who went by “Willie”) was born on May 26, 1891, in Vance County, N.C., to William Baker and Ada T. Meadows Daniel. By 1900, Daniel family was living in Vance County still, where William Baker Daniel was working as a farmer. At some point, Willie Daniel attended an unidentified college for four years apparently. Prior to his registration for the federal draft for World War I, Willie Daniel was working as a secretary in a tobacco planters warehouse in Henderson, N.C. He was inducted into active military service for World War I on May 25, 1918, in Henderson. Daniel was initially assigned in the U.S. Army to the 156th Depot Brigade at Camp Sevier, S.C. He was transferred on June 24, 1918, to Company C, 324th Infantry Regiment, 81st Division, U.S. Army. Daniel left with his unit from the United States for Europe aboard a troop transport ship on August 5, 1918. He reached the rank of Corporal on September 1, 1918. He remained in Europe with the U.S. Army of Occupation. Daniel was promoted to the rank of Sergeant on April 13, 1919. He arrived back in the United States on June 18, 1919, and was honorably discharged from active military service on June 24, 1919. Soon after his discharged, Willie Daniel would marry Frances S. Jeffress in Mecklenburg County, Virginia (directly across the state line from Henderson, N.C.), on September 2, 1919. After the war, Willie Daniel returned to Henderson, N.C., and took up his secretary job at the planters warehouse. By 1930, he was working as an operator of a tobacco mill house in Henderson. By 1940, Daniel was a co-operator of a tobacco warehouse in Henderson. William B. Daniel died on March 15, 1963, and was buried in Elmwood Cemetery in Henderson, N.C.
James William Dickie (who went by “Jamie”) was born on October 25, 1893, in the city of Henderson in Vance County, N.C., to George Thomas and Manolia K. Coppedge Dickie. The Dickie family lived in the city of Henderson in Vance County up through World War I. Jamie Dickie attended college at Wake Forest College (present-day Wake Forest University) in Wake Forest, N.C., as a freshman in 1911. In 1914, he graduated from Wake Forest College with a B.A. degree. Dickie received his medical degree in 1917 from Jefferson Medical College (present-day Sidney Kimmel Medical College of Thomas Jefferson University) in Philadelphia, Pennsylvania. Immediately out of medical school, Jamie Dickie enlisted for active military service in World War I in the U.S. Navy Medical Corps on January 10, 1918, while in Philadelphia. Initially, he was given the rank of Hospital Apprentice First Class on a station ship in the 4th Naval District in Philadelphia, Pennsylvania. On May 31, 1918, Dickie was discharged from his position in Philadelphia, and assigned to the U.S. Naval Hospital at Fort Lyon, Colorado, as an officer with the rank of Lieutenant (Junior Grade) in the Navy Medical Corps. He never served in active combat duty or overseas in Europe during WWI. Dickie was discharged from active military service on September 3, 1919, at Fort Lyon, Colorado. After the war, Jamie Dickie moved to Asheville, N.C., where he worked as a physician by 1920. In Asheville, he spent two years working with Dr. W. L. Dunn of Asheville, where he specialized in pulmonary diseases. Dickie moved to Southern Pines, N.C., after this, where he founded the Pine Crest Manor Sanitorium, that specialized in the study and treatment of pulmonary diseases. It was particularly focused on tuberculosis. He continued to receive post-graduate education, including at the University of Pennsylvania in Philadelphia and the Peter Bent Brigham Hospital in Boston. Dickie was a director of the North Carolina Tuberculosis Association. After returning in 1937 from his advanced study, Jamie W. Dickie contracted and died of pneumonia on July 6, 1937. Durward (also spelled “Durwood”) Thomas Dickie was born on April 2, 1895, in Vance County, N.C., to George Thomas and Manolia K. Coppedge Dickie. 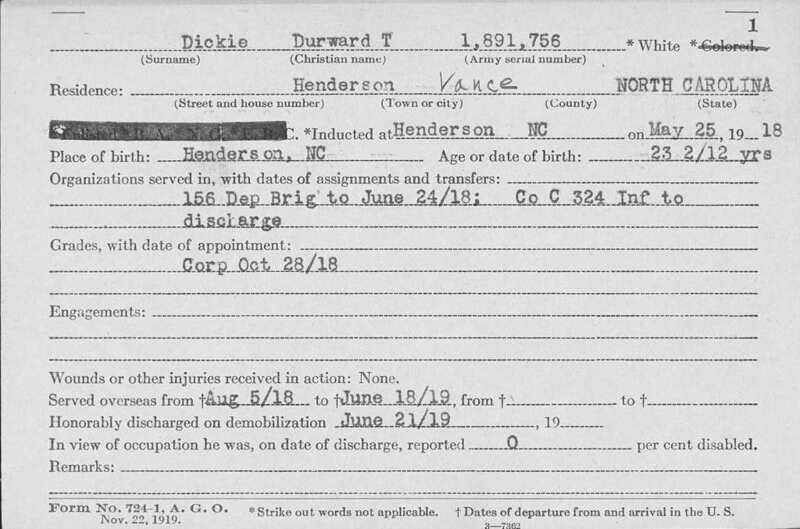 The Dickie family lived in the city of Henderson in Vance County up through World War I. Durward Dickie was inducted for active military service for WWI on May 25, 1918, in Henderson, N.C. He was initially assigned in the U.S. Army to the 156th Depot Brigade at Camp Sevier, S.C. Dickie was transferred on June 24, 1918, to Company C, 324th Infantry Regiment, 81st Division, U.S. Army. He left with his unit from the United States for Europe aboard a troop transport ship on August 5, 1918. Dickie reached the rank of Corporal on October 28, 1918. He remained in Europe with the U.S. Army of Occupation until arriving back in the United States on June 18, 1919. Dickie was honorably discharged from active military service on June 21, 1919. After the war, he returned home and would live in Vance County and Franklin County, N.C. for the rest of his life (although it is not known if he lived elsewhere for short periods after 1940), and would operate a general store and/or work as a merchant during the 1930s and 1940s. Durward T. Dickie died on August 18, 1965, in Vance County, N.C., and was buried in New Bethel Baptist Church Cemetery in the small community of Epsom, N.C.